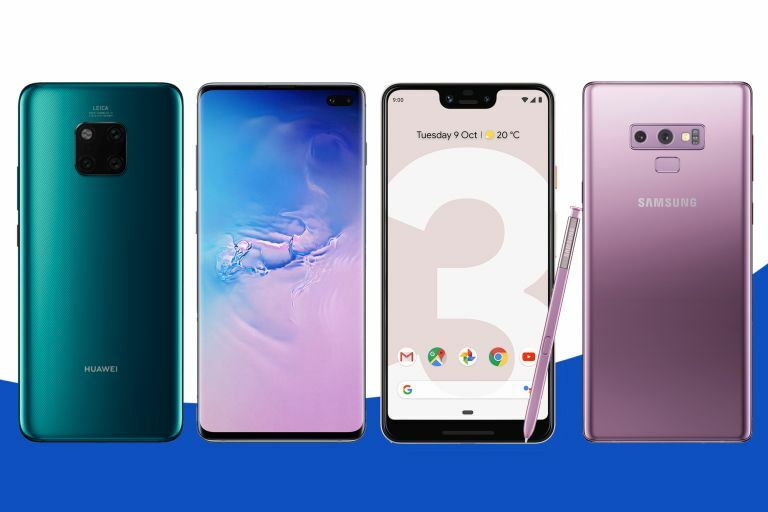 You're after the best Android phones available in 2019, and we're happy to oblige: here we've picked out the very top handsets money can buy at the moment, including phones from the likes of Samsung, Google and Huawei. The best Android phone of 2019 isn't necessarily going to be the same for everyone of course, and with that in mind we've covered a range of different phone makers, prices, features and sizes. Whatever you're looking for, you should find something of interest here. Ready to discover the best Android phones money can buy in 2019? Let's dive in! If you're looking for the best Android smartphone money can buy, stop reading and buy the Samsung Galaxy S10 Plus. Simply put, this is the fastest, most feature-packed and refined Galaxy smartphone Samsung has ever built. The Galaxy S10 Plus is the first handset to employ its all-new Infinity-O design with an AMOLED panel. And what an AMOLED panel it is! The screen is staggeringly good, with gorgeous colours and cavernous blacks. The Infinity-O design, which relocates the front-facing camera to a pill-shaped cut-out in the top right-hand corner of the display, has allowed Samsung to fit the S10 Plus with an expansive 6.4-inch AMOLED panel – that's the same size as the Galaxy Note 9 – while simultaneously shrinking the physical size of the handset compared to the 6.2-inch Galaxy S9 Plus from last year. Elsewhere, there are dual-selfie cameras to enable Live Focus photos packed with bokeh-style blur, a new ultra-wide angle camera in the rear-mounted triple-camera, and an ultrasonic in-display fingerprint scanner that works with wet hands. Finally, the new One UI operating system, which is based on Android Pie, is infinitely better than anything from the likes of Huawei, LG or Sony. One UI has been designed from the ground-up to acknowledge that while we all want massive screens on our phones, massive smartphones are really annoying to use, especially one-handed while squished into the train carriage during a morning commute. To solve this headache, One UI shifts all the elements of the user interface that you’ll actually need to tap into the lower-third of the touchscreen where they are within easy reach. Of course, there are some nitpicks with this flagship phone – which we cover extensively in our Samsung Galaxy S10 Plus review, but none of these stop this from becoming our new go-to recommendation for anyone who wants the best Android handset around. "When you've got a device that not only packs the world's fastest CPU, but also one with some genuine sit-up-and-take-notice features like a fantastically executed in-display fingerprint reader and futuristic reverse wireless charging ability, it's easy to see how the Huawei Mate 20 Pro rises above the me-too melee." And rise above it does, with a simply stunning hardware, screen, camera and software package propelling it towards the very top of our best Android phone buying guide. The 4,200 mAh battery, for example, is capacious and long-lasting, while the OLED, HDR, 19.5:9 screen is a crisp, colour-rich stunner. Three powerful camera lenses on the back (40MP + 20MP + 8MP), as well as a ridiculously potent front facing lens (24MP! ), make photography a dream, while the combination of 6GB of RAM with the Kirin 980 CPU means incredibly high benchmark scores. Oh, and the in-display fingerprint reader and reverse wireless charging capability is hat-tippingly impressive, adding genuine wow-factor to a device that takes desirability in Android phones to an entirely new level. The Google Pixel 3 phones aren't a huge leap forward from the Pixel 2 models, but they are enough of an upgrade to warrant a place on our list of the best Android phones for 2019. The specs above refer to the larger Google Pixel 3 XL – if you prefer you can pay a little less money for the slightly smaller (and notch-free) Pixel 3 instead, as almost all the specs are the same. Inside the phones we have the Snapdragon 845 to keep everything ticking along nicely, while Google is now using a glass backing to enable wireless charging on the Pixels for the first time. Its traditional two-tone design is still in place though, with a textured finish that feels good in the hand. As in previous years though, it's the camera where the Pixel 3 and Pixel 3 XL really stand out: even though it's a single-lens model, it's capable of some fantastic shots, especially with upgrades like Night Sight for low light photography. It's perhaps the main reason you would pick the PIxel 3 as the best Android phone on the market. Another reason would be those speedy Android updates, straight from Google. There's no bloatware or extra Android skin here, so you're guaranteed a slick and intuitive software experience for years to come. Google's individual apps continue to impress too, though of course you can get them on any Android or iOS phone. Ladies and gentlemen: the Samsung Galaxy Note 9. The third of three fantastic flagship phones Samsung put out in 2018, the Note 9 excels in every department, from the quality of the components under the hood, to the fit and polish of the design, to the impressive results you can get from the dual-lens camera. What really makes the Note 9 stand out on this best Android phones of 2019 list, though, is that superb S Pen stylus. It's been improved and upgraded this year with Bluetooth functionality, so it can now (for example) control music playback and operate the camera shutter remotely, as well as all the usual tricks. With a screen size of 6.4 inches, and a 4000mAh battery inside, this is a phone that you can get some serious work done on. There's also some excellent audio capability packed in here, with Dolby Atmos and UHQ upscaling included. Whichever part of the Note 9 you look at, it ends up impressing. It does have a high price attached, which is going to put some people off, and the on-board Bixby AI is definitely still lagging behind what the likes of Siri and Google Assistant can offer. Overall, though, a top-level Android flagship and well worth a place on our best Android smartphones list. We really, really like what Huawei has managed to do with the Huawei P30 Pro, and it easily slides into our best Android phones of 2019 list. It makes an appearance at the expense of the P20 Pro, and builds on everything that made that 2018 handset great as well. We're talking internal components that are enough to give it lightning-fast performance (note the Kirin 980 processor and up to 8GB of RAM), as well as a quad-lens camera capable of performing some really impressive tricks – not least a whopping 5x of optical zoom! This being a Huawei phone, the software experience is a long way from being the best in the business. However, the excellent hardware and build quality means that the P30 Pro ends up a long way in credit when everything is considered. The Xiaomi Mi 9 is one of the best phones for mixing looks and performance. There's a lot to like about the Xiaomi Mi 9, which offers some of the best specs you're likely to see in an Android flagship in 2019, and looks really good too – the thin bezels and teardrop notch put the focus on the bright, vivid 6.39-inch screen. When we tested out the phone we were also impressed with the Xiaomi Mi 9 camera, which got great results in most conditions, and the battery life. It's going to give some serious competition to Google and Samsung this year. There are some minor niggles worth talking about, including the lack of waterproofing and the MIUI software that Xiaomi puts on top of Android – it's not quite the polished software experience that you get from Google or Samsung. What really makes the Xiaomi Mi 9 stand out as one of the best Android phones of 2019, though, is the price: it's available for significantly less than the S10s and Pixel 3s of this world, and represents excellent value for money. The Nokia 9 PureView has no fewer than five – count them, five – lenses making up its rear camera, and that means it's capable of taking some seriously good photos (even if your mobile photography skills leave a lot to be desired). It's not all about the camera though. Nokia's newest flagship device comes complete with a Snapdragon 845 processor and 6GB of RAM, so it's not going to be slowing down anytime soon... even while it's taking 60MP photos. You can get better specs than those with some of the other best Android phones of 2019, but factor in the price and the rather appealing build quality, and this is definitely worth a spot on our list. Slowly but surely, Sony's phones are getting better (and more modern-looking) with each passing year, and the Xperia 10 Plus is definitely going to turn heads thanks to its 6.5-inch, 21:9 aspect ratio display. Whether you're binge-watching Netflix or trying to fit two apps on screen at once, that screen is going to come in handy (the high-resolution audio helps as well). This being Sony, the camera optics are top-notch too, and a dual-lens rear camera gives you 2x optical zoom. Some of the other specs are distinctly mid-range but the Sony Xperia 10 Plus will still handle everything you throw at it admirably. You have to factor in the price too, which helps make this one of the best Android phones of 2019. Samsung has been knocking it out of the park with its phones for several years now, and the Samsung Galaxy S9 Plus is further evidence of what a good run of form the South Korean multinational is in. It's hard to pick a weak spot: Samsung's latest flagship looks fantastic, is super smooth in operation, has a camera that can't really be bettered, and offers up some cool software customisation tricks as well. It's expensive, certainly, but that's kind of unavoidable up at this end of the market. If you pushed us to pick a highlight, it has to be that 6.2-inch Super AMOLED Infinity Display, with very little in the way of bezels and a sharp 1440 x 2960 pixel resolution. Samsung has really led the pack in terms of screens in recent years and it's a display that's hard to take your eyes off. Everything is powered by a very capable Exynos 9810 or Snapdragon 845 chipset, depending on where in the world you live, and that's coupled with up to 6GB of RAM and 256GB of internal storage. You can add to that IP68 waterproofing, wireless charging, and an iris scanner... it even has a 3.5mm headphone jack. HTC might not attract as many headlines as the likes of Samsung or Google, but it continues to push out some top-quality Android phones, and the HTC U12+ is its latest flagship smartphone (don't worry, you didn't miss the U12 – HTC went straight to the Plus version). The phone certainly competes with the best on the hardware front, and you get a Snapdragon 845 processor and 6GB of RAM under the hood here, together with up to 128GB of storage space (and a microSD slot to add more). The 6-inch, 1440 x 2880 pixel LCD display looks the part too, and HTC has decided to avoid the display notch by keeping a thin bezel all across the top of the screen. Around the back of the phone there's a dual-lens 12MP+16MP camera, and like several HTC phones before it, it's capable of some very impressive snaps. You also get a host of unusual features you don't get in many other handsets, like the advanced BoomSound speaker audio system, and the Edge Squeeze feature that lets you squeeze the sides of the phone to launch certain actions. The glossy design won't be to everyone's tastes, the battery life isn't as great as some of its rivals, and HTC's take on Android isn't one of the best either – but these are minor quibbles with what's otherwise a very good Android flagship. LG continues to try and keep pace with the big hitters of the Android world, and with the LG G7 ThinQ it just about manages it. That rather odd "ThinQ" label appended to the name refers to the additional smarts that LG is putting into its devices now, by the way. So, for example, there are some custom Google Assistant commands here for launching different actions for the phone, and indeed a dedicated physical button for getting the Assistant up on screen – not something you get with many handsets. The AI influence extends to the camera, which can recognise the type of scene you're trying to shoot and adjust the settings accordingly. The phone is powered by the Snapdragon 845 chipset and up to 6GB of RAM, so you shouldn't have any complaints on the performance front, while the dual 16MP+16MP rear camera we've already mentioned is one of the most capable around too – though it doesn't touch the heights of the Samsung and Google phones. We'd say this is one of the most attractive-looking Android phones on the market too, though your mileage may vary depending on your fondness for display notches. The bright, sharp 6.1-inch LCD screen comes with a resolution of 1440 x 3120 pixels. Note that the launch of the LG G8 ThinQ is imminent, which might be a better bet for you, depending on pricing. Motorola (now owned by Lenovo) has been pushing out top-quality, low-price Android phones for a while now, and the Moto G7 continues that tradition. You don't get the very best in specs and components of course, but it's available at a price that won't take up too much of your hard-earned pay packet. One of the benefits of internals and screens that aren't at the very cutting edge of tech is that battery life improves accordingly, and you should be able to go for a full day and beyond with this. Despite its budget price, the Moto G7 has plenty of appealing features, including a spacious 6.2-inch screen, the latest version of Android, and a dual-lens rear camera that won't let you down. Definitely worth a place on our list of the best Android phones for 2019.